An ADS is a laser beam that developed not only for combat purposes, but also can deployed in a non-lethal application suitable in policing community and security enforcement tasks for the crowd controlling and riot dispersal in order to maintain law and order. 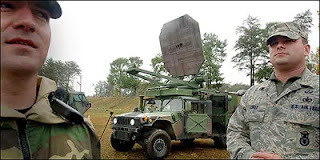 Active Denial Systems (ADS) offers such an unique specialty and this is one of the reason both military and police force are interesting in this particular technology, that being developed by some countries already mainly the U.S,Chinese, Russians and Indian and among other military forces. Any authority in the possession of ADS can enable to use it as a deterrence against some unruly people or dispersing illegal protesters without causing any physical harm or killing them. The technique being demonstrated here on this blog has one conceptual idea same exactly like water cannon that used by several Metro-police units in efforts to disperse and re-constrain industrial demonstrations in urban areas, which sometimes organized illegally and so behavioral destructive. However, ADS is more strategic than simple water cannon in its deterrence approach, when it systematically subduing violent agitations more resiliently. Non-lethal technologies are developed in a response to fulfill the role of defense-policing needs. Instead of a police using its deadly force against activists, ADS offers another option , when the state's machines used none-lethal technology as a last resort. Non-lethal technologies can be also used as means of personal protection, peacekeeping, humanitarian missions and other situations in which the use of lethal force is undesirable. 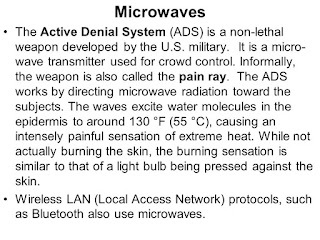 The system creates an uncomfortable pain-like feeling on fire.The system deploys powerful electromagnetic beam which is a part of Electromagnetic Warfare (EW). Active denial system is a breakthrough in achieving non-lethal weaponry that uses millimeter-wave electromagnetic energy to stop, deter and intimidate an advancing adversary from relatively long range. It could possibly save countless lives by providing Law Enforcement Agencies an alternative way of stopping the lynching individuals without causing injury,thus this can avoiding unwanted confrontation that usual led into deadly political escalation and civil wars. The ongoing studies and researches in this regards will expedite these advanced technologies to the policing community as well as to the military utilities by evaluating the system under a series of realistic combat scenarios to determine its potential effectiveness in a full-swing hostile-environment. The system is intended to protect security personnel from coming closer with small-arms fire, which is generally taken approximate at the range of 1,000 meters by undisclosed elements within the crowd. The system is described as having a range about 2 km. Therefore this is a good tactical countermeasure against the weapon fire that could further shielded with appropriate cover for example driving inside an armored vehicle. The active-denial technology would work in most weather situations like in rainy, foggy or sea-spray conditions where the beam's energy couldn't badly affected when it permeating through moisturized materials or in the atmospheric water. Active Denial Technology uses a transmitter to send a narrow beam of about 95-GHz millimeter waves toward a certain identified target. It traveling at the speed of light, so fastest than any type of projectile like bullet, the energy when reaches the target it penetrates less than 1/64 of an inch into a skin, quickly heating up the skin's surface. 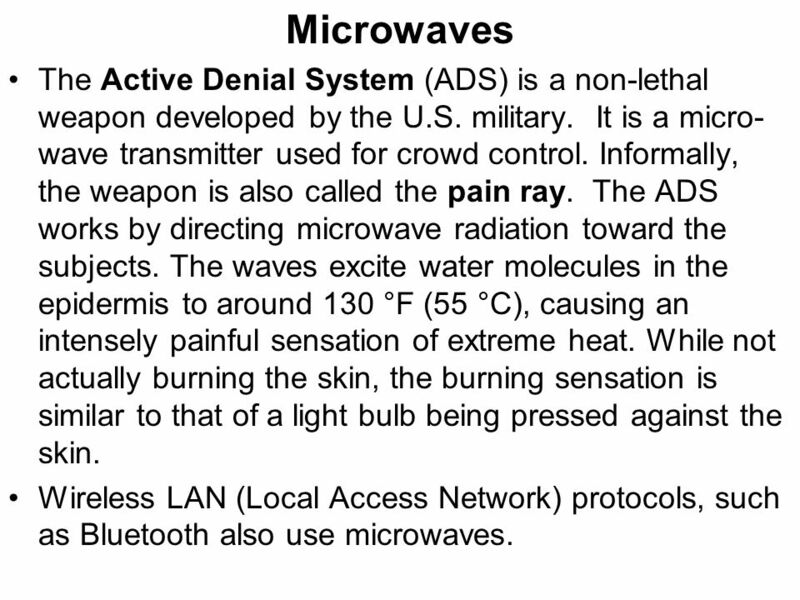 The 95-GHz energy after penetrated into the person's skin, produces an intense burning sensation that stops when the transmitter is switched off or when the individual moves out from the arc or range of the beam.